After holding up its admission for years, Greece became the first nation on Friday to ratify fYROM 's membership of NATO after the 2 States resolved a decades-old name dispute last month. NATO members signed the accord with fYROM this week, days after the Hellenic Parliament endorsed an agreement between Athens and Skopje that changes its name to North Macedonia. Staring down strong domestic opposition from Greeks worried the Balkan neighbor was appropriating Greek heritage, the government of leftist Greek Prime Minister Alexis Tsipras pushed the name change through Parliament on January 25th. Under NATO alliance rules, the membership now has to be approved by each member state - giving Greek lawmakers the opportunity for another round of verbal jousting over the controversy. The dispute had frustrated Under NATO alliance rules, fYROM attempts to join the EU and NATO: Greece is a member of both and has veto power over other countries joining. 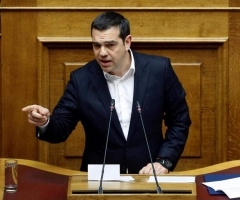 One lawmaker described the pact as, “worth spitting at”, another that Greece was “humiliated”.